Ashala Wolf is an Illegal: a human being with a special power in a world where such powers are outlawed. She is also leader of the Tribe, a group of runaway children who are likewise gifted. When one of them betrays her into the hands of a sadistic government official, she must fight with everything she has to protect the rest of the Tribe. I read this book as part of the Diverse Universe reading challenge and I feel it was a great choice. Diversity is very much at the heart of this story. Ashala Wolf is of Aboriginal ancestry, as is the author. However, Kwaymullina chooses not to focus too strongly on this and instead presents a world where race no longer holds relevance. In the wake of the apocalypse, humanity had more to worry about than skin colour, and there are characters of varying heritages living alongside each other without regard for race. Rather than erasing people of colour, Kwaymullina shows a world where they have equality. This world is not without its own issues. People are now divided into different categories. In the three hundred years since the apocalypse, humanity’s remnants have focused on maintaining a nebulous Balance. People with powers considered strong enough to disrupt the Balance are deemed Illegals and confined to detention camps. The language (Illegals, Citizens, detention camps) clearly connects the story to current Australian issues of race and human rights. Creating a new minority instead of focusing directly on existing ones allows these issues to be presented in a way that is less confronting and more accessible to a young adult market. As is the fashion with most YA, the novel is told from a first person point-of-view. Ashala Wolf is an engaging but not entirely reliable narrator. I appreciated seeing both her defiant strength and the way she wears her heart on her sleeve. These qualities make her an excellent leader and create an uneasy relationship between Ashala and her guard Connor that strongly reminded me of Juliet Marillier’s Shadowfell (a book I adore). This ultimately made it a little predictable for me, but I found I didn’t mind. The Tribe members were quite distinct, with very individual flaws. Most of the adult characters lacked nuance in comparison. Since The Interrogation of Ashala Wolf is a debut novel and the first book in a series, I hope this shortcoming might be rectified later. Kwaymullina uses an unusual story structure that probably won’t appeal to everyone and it causes an otherwise fast-paced novel to flag a little in the middle. However, I felt this was a necessary change of pace that fit in well with the plot. It was the last confrontation of the novel that left me somewhat unsatisfied, as it lacked enough weight and foreshadowing for it to seem like more than simply a plot device. 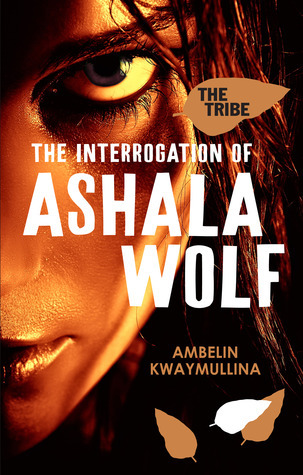 Overall, I found The Interrogation of Ashala Wolf to be an excellent read, making me glad I participated in the Diverse Universe reading challenge. I will definitely hunt down the next book in the series. If you’re interested in reading more reviews connected to the Diverse Universe reading challenge, you can find them collected at BookLust. It certainly did! I very much appreciate all the hard work you put into running it and I’m looking forward to participating again next year.